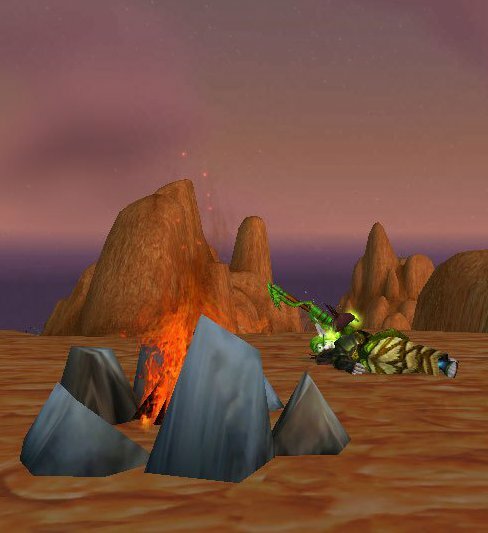 "Theramore destroyed... Ashenvale attacked but holding... The Alliance leadership calling out for Horde blood and vice versa... We of the Cenarion Circle must stand together more so now than ever before. This is why I have gathered you, my closest druid friends, here for this most sacred rite. Will you partake with me in this ceremony calling on the Earthmother for guidance, here in this land most troubled by recent events?" My eyes roamed over those gathered, taking in the calm fierceness of my tauren friend, the wild strength of my worgen friend, and the spiritual vigor of my troll friend. Each of them nodded in solemn affirmation. I knelt on the red clay earth of the mesa we had chosen for the ritual. Touching my hands to the warm ground before the fire I looked up at my friends. "We are of all different races and all different beliefs, but we all strive for a common goal. This is not a rite of my people, but one of yours." I nodded significantly to the tauren. "Will you lead us?" He tossed his tawny mane and grunted, the sound coming from low and deep in his chest, then nodded in agreement. He silently gestured for the rest of us to kneel in a circle around the fire. "I have already prepared the Water of the Seers," he rumbled as he began to poor the liquid into small clay cups, delivering them to each of us, then taking his place to close the circle. He began to chant slowly in Taur-ahe. When his chant was complete he poured the remaining sky blue liquid from the ceremonial pitcher into the fire. The fire burst up into bright white flames licking at the moon-filled sky. Then he nodded for us to drink. "Now be silent with your thoughts. Watch the fire or the sky. Feel the Earth. It will not be long before she speaks to us, although we may each experience it in different ways." I turned my eyes to the earth and found there a group of ants toiling away at some project. They were carrying small pieces of grass and dirt, marching off in a straight line as if to war. I sat and watched this for a long while, my thoughts slowly changing, my mind and spirit opening to new ideas. Eventually my mind wended its way to the realization that we are just like the ants, with the Dragons and Ancients watching over us, and the Titans watching over them. And what if there are bigger things watching over them, and bigger things watching over them, and so on... Where does it stop? What is the meaning of it? Why? Feeling rather panicked and nearly overcome with the feeling of smallness and unimportance, I suddenly heard a deep, calming female voice telling me to be at peace. If you've ever spoken to the Stonemother, Therazane, this is what the voice sounded like, slow and deep and very peaceful, but also very powerful. I can't remember the exact words that She spoke to me, but I am very certain that I did indeed hear from the Earthmother that night. She told me that all would be well, that there is meaning to the world and the things we do, though She could not tell me more than this. She told me that the choices I have made are right and that as long as I follow my heart and soul my choices will continue to be right, at least to Her. This is all I remember. I woke at dawn, the fire still blazing, but I was the only one there. I stretched and took a drink of water from one of my travel pouches, then doused the fire with the rest. I shifted into Storm Crow form and flew off in search of my friends.